James Dalton is the Coordinator of Global Initiatives and ad interim Director of the IUCN Global Water Programme based in IUCN Headquarters in Switzerland. Prior to IUCN he was based in Fiji at the Pacific Islands Applied Geoscience Commission (SPC-GSD) as an Integrated Water Resource Management Adviser. In a prior life he was a consultant for ITAD-Water, a specialised consultancy based in the U.K. He is an irrigation engineer and holds a PhD in Civil and Environmental Engineering focussing on groundwater management in the Aral Sea Basin. Peter Newborne is Research Associate to the ODI water policy programme which carries out applied research in water policy and practice, including recent studies of private sector involvement in relation to water, both water resources management and water supply, sanitation and hygiene. CDP announced in their report launched at COP22 in Marrakech a staggering USD14 billion in water-related impacts on company operations. As the global economy looks to the private sector to play its part in the transition to a sustainable and resilient future, resource managers and investors are becoming increasingly concerned that water management may limit this transition. The recent report by the International Union for Conservation of Nature (IUCN) and the Overseas Development Institute (ODI) highlights the evolution in corporate behaviours that will be required for companies to become good water stewards. 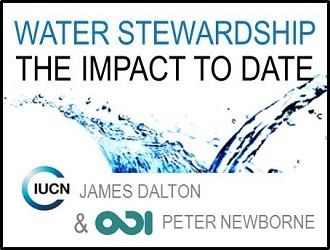 Given the importance of getting this right China Water Risk sat down with the report’s authors, James Dalton of IUCN and Peter Newborne of ODI, to find out more. China Water Risk (CWR): Your recent study has looked at the broad progress made by companies engaging in water stewardship. What motivated you to do this study? James Dalton (JD) & Peter Newborne (PN): Engagement with the private sector has almost become de rigeur in relation to water management. There is an expectation now that, with most water management programmes, some form of private sector engagement is required. But often it’s not clear what is required from company partners beyond perhaps some resource contribution and cost sharing. We wanted to better understand this – to find out how corporate water stewardship is helping broader water resource management as well as what will motivate businesses to engage, especially in water management beyond the ‘factory fence’. CWR: What did you find out about the roles of corporates in water programmes – why are they getting so much attention? JD & PN: Generally, there is an expectation of finance from them, without a doubt. There is the recognition that they are an important and often powerful stakeholder, and in sectors such as food and beverages, chemicals, energy, mining and manufacturing, a significant water user. Since 2008 the global economy has required a re-boot in investment. Governments and international financing institutions are interested in using the private sector to both stimulate public sector approaches to help shift economic sluggishness, and to use that to mobilise financial and human capital, invigorate tax bases, and improve trade relations and employment opportunities. For example, corporates may bring expertise and technologies to help formulate water solutions. Meanwhile, companies are increasingly encountering disruption to their businesses due to water scarcity, floods, and interruptions to water supply. Multinationals in sectors that use substantial amounts of water may now expect to encounter water supply difficulties in their operations and supply-chains. CWR: What are some of the main findings from the study? JD & PN: Well, there are many, and they are relevant to a broad audience, so we hope readers will take away from the study what they need. Given the limelight stewardship seems to be enjoying, there is a surprising lack of published data. It is not clear as yet what success looks like. Driven by many of the media channels that corporates support, there are some useful lessons on efficiency gains for example, and some interesting new tools, for example in risk assessment, but there is a shortage of independently documented stories of water stewardship practice – a few, but really not many compared with the marketing and sound-bytes. There seems to be a lot of work going on, site by site, in places assessed as high risk, but much is within the company fenceline as opposed to out in the river basin/catchment. Getting objective and verifiable information is a challenge. Where activities are happening outside of corporate sites there are many assumptions made about who is benefiting, and frankly a lot of claims made about likely development impacts which may not stand up to scrutiny. Although attention is being paid to water stewardship and what it can achieve, we found that it is, at least as yet, far from a mainstream approach, even within companies. Philanthropic funding helps to support new thinking, but changing the ‘DNA’ of business practice in line with the standards and guides to stewardship needs more than CSR projects – it needs re-thinking and re-alignment of business practices, accounting, and training for the long-term. But this is also not easy. Companies are struggling to serve all their constituencies, from commercial bank loans, via dividends for shareholders, employees, consumers, regulators, through to local communities and environmental needs at the other extreme. Our report tells of how the downward pressure on food prices makes it difficult for farmers and other businesses in the food supply chain to devote time and resources to good water and land management. For water stewardship to work, private companies and other actors need to be able to capture and internalise those costs. So, while the business concern is evident – all company representatives talked of water problems already encountered and future difficulties being assessed – in practice companies are struggling to put numbers on water risks to support the business case for action. CWR: So what should companies be doing more of? JD & PN: First, they need to get better at developing useful targets. Internal efficiency targets are useful from an internal technical perspective, but they don’t really help companies understand water concerns outside their fence-lines that may affect them. Risks increase potential liabilities, and increase competitive concerns. Pre-competitive platforms where companies and regulators can better identify and agree water risks, agree on data collection and sharing, can help improve the situation for all concerned. Companies can usefully work with regulators to set smart water allocation and management rules and ensure compliance, while helping companies achieve their own targets and contribute to national and regional commitments to public sector and international goals such as the SDGs. All of this enhances the role of the private sector. CWR: What is the role of donors and investors in supporting corporate water stewardship? JD & PN: Donors have engaged on the topic, but only some, and only recently. Stewardship has tended to confuse those supporting the conventional concept of ‘IWRM’ (integrated water resources management). Business is a water stakeholder, but corporates have not been that involved in multi-stakeholder water consultations until recently. Partly this has been companies’ choice and partly because water security concerns for business have only really become better understood over the last 5-10 years. The positioning of water as a top risk at the World Economic Forum meeting in Davos has helped to highlight the importance of water. It has sparked work on water risks by many different organisations and the academy. But it has not created an evolutionary change in business approaches and practices to water, to-date. Nor are risk management tools sophisticated enough as yet to help companies identify the investments and investment trade-offs as required. We used some of your own work to help us triangulate our understanding of risk awareness, and clearly some companies are better at this than others. Overall though, investors are not yet aware enough about how water risks can abruptly become major water problems, which means that those concerns are not cascading into operational business practices. One of the best features of water stewardship initiatives is as a catalyst to bring stakeholders to the table, to generate ideas and identify resources. This can help to stimulate some frankly flagging IWRM processes that often don’t get anywhere near implementation, or, if they do, it’s because of predominantly donor-financed activities as compared with national, including private sector, investment. 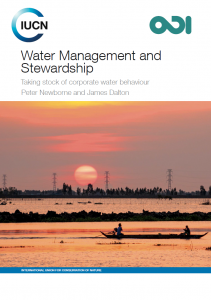 Stewardship can potentially act as a means for powerful business stakeholders to hold governments to account on water management, and help to link economic returns to water resource governance. Poor public sector performance in managing water limits good private sector performance and therefore limits inward investment in river basins. Donors have to be supporting that. CWR: How is the public sector responding? JD & PN: Slowly. In some countries there are few companies seeking to engage in water stewardship, and where the private sector takes a small proportion of the water it is not such a concern. That said, agriculture is the big ‘hidden’ consumer of water. Industrial demand for water is rising, slowly, as economies shift, from 17% up to around 20% of total water withdrawals. But it is agricultural supply chains, from small scale growers to wholesale commercial operators where hopefully more stewardship activities will take place. Agriculture is dominant in global water use – an estimated 80% of total global water use is consumed in food production, and it is heavily intertwined with the private sector. Smart regulators can force their hand though. When enough is enough in terms of pollution, for example, regulators have the chance to force a step change in behaviour through water allocation reform to change behaviours. So far, stewardship programmes have not paid enough attention to regulators or included them adequately in discussions. CWR: Who should be reading the report? JD & PN: It is written for companies currently implementing or interested in implementing water stewardship, the ‘broker’ agencies as we call them – the consultants and NGOs who assist in establishing these stewardship activities – as well as the international donors who are financing some of these activities. Also, investors and sustainability organisations funding corporates or reporting on their performance, plus public sector officials in different countries who are contemplating partnerships with the private sector around water stewardship. We had some comments from readers about the length of the report. We thought this was quite interesting because it reconfirms how people nowadays use straplines and sound-bytes to help guide them, looking at summaries and bullet-points without spending the time to read in-depth analysis. One reason we did the study was that water stewardship is dominated by brief case studies and brochures, but there is little analysis shared. CWR: What role is there for companies in the future? JD & PN: Supporting the collection and sharing of relevant data is key – hard, but key. Public water management agencies need the information to better allocate and protect water resources, but they cannot do this in the absence of resources. Water stakeholders need to pool data for better basin management. There is a large opportunity with climate finance. Healthy river basins will require sustainable natural and built infrastructure as well as technology services to support strong and consistent economic output and minimise risks from climate change. Where water is being mis-managed, adapting to climate change is going to be much harder. Companies, especially those involved in food and nutrition, need to be more aware of supply chain risks and the contributions they could make to help shore up sustainable supply chains by using their influence, expertise, and technological investments and ideas. The future looks exciting for companies that are willing to look at the opportunities as well as the risks. The recent position statement on water stewardship by the International Council on Mining and Minerals demonstrates a mature industry-led perspective, and should be seen as a guide for other sectors to follow. CWR: What can the water management community learn from this? JD & PN: That there is no silver-bullet. Corporates are not donors after all. They are interested in their gains from stewardship activities primarily. Objectives will always be different, so there is a need to find common ground, accepting the different objectives that different parties want to achieve. Irrigators, public and private, must become more aware about putting water efficiencies into basin contexts. The water community must avoid side-lining existing water management approaches such as IWRM – instead accepting those processes and working with them, rather than pretending they don’t exist.